The definite three disc Blu-ray set. 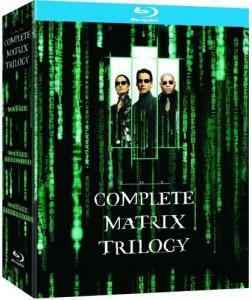 The Complete Matrix Trilogy features all three films in the trilogy together for the first time ever in stunning high definition, with a newly re-mastered picture and sound for The Matrix. Also included is the companion piece The Matrix Revisited, two new audio commentaries on each film, Enter the Matrix video game footage, deep-delving featurettes/ documentaries and much more! The Matrix: Perception: The Everyday World is Real. Reality: That World is a hoax, an elaborate deception spun by all-powerful machines of artificial intelligence that control us. Mind blowing stunts. Techno-slamming visuals. Megakick action. Keanu Reeves and Laurence Fishburne lead the fight to free humankind in The Matrix, the cyber thriller that you will watch again and again. Written and Directed by the Wachowski brothers (Bound), the story sears, the special effects stake out new movie-making territory - the movie leaves you breathless. The Matrix Revolutions: In this final explosive third installment of the Matrix trilogy, the city of Zion, last bastion of the human race, defends itself against the massive invasion of the machines as Neo attempts to fulfill his prophecy as 'The One'. As the Machine Army wages devastation on Zion, its citizens mount an aggressive defense - but can they stave off the relentless swarm of Sentinels long enough for Neo, adrift in a no man's land between the Matrix and the Machine world, to harness the full extent of his powers and end the war?